Mark stated in last week's post that he and I will be writing along different paths for a while. I think of us more as starting our blog collaboration at opposite ends of the same path. It may take us a while to travel to a central rendezvous point, but once there I hope we will have learned enough to strike out together on the route of a common purpose. Mark has blogged several times in the past about the importance of funding research relevant to Usher syndrome. Indeed, research doesn't happen without this funding-the treatments we're all hoping for will not appear if no one works on the problem, obviously, and science is expensive. However, research funding is just one component in this process. In the next few posts, I'm planning to present an overview of biomedical research, and I'll begin by discussing the general flow of information from the laboratory bench to the patient. And of course, you must mentally insert Dollar, Euro, Pound, Yen, etc. signs at every interval. Lots of them. However, even with plenty of money to grease the wheels, progress toward the top tier can be painfully slow. The way forward is often unclear, and can remain so for long periods of time. Moreover, the early stages of the pathway depicted above, the real life situation is nothing like a nice straight arrow, but much more akin to a convoluted, intersecting wad of spaghetti. Actually, even that is an oversimplification, as in reality there would be multiple wads of spaghetti, all equally and sufficiently funded, but only some of which would straighten out in a direction toward a treatment or therapy, in time. You may well be wondering why, in this time of economic cutbacks, would anyone advocate pumping money into a system with such an inauspicious and seemingly inefficient starting point? Can't the early stages of the pathway be optimized somehow? After all, things do tend to become more streamlined and targeted near the top of the chart, and necessarily so. Clinical trials are expensive and laborious, and finding human subjects can be very difficult, so it makes perfect sense to test only the treatment with the best results to date, and therefore the best chances of success. Why not put the bulk of our financial resources behind the research with the highest probability of advancement toward the cure? We can't, because the earlier, less directed steps are crucial for illuminating the path to the desired goal. That streamlining effect on the top simply can't happen without a broad basis of scientific discovery at the beginning of the process. The trial and error inherent in the earlier steps is what defines the research directions pursued in the upper tiers. 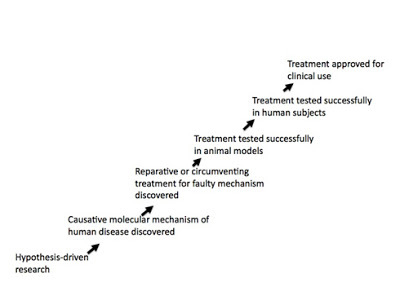 Reflecting on the discoveries of the last century that have led to improved human health, it's easy in hindsight to identify the seminal discovery that paved the way for the eventual development of a new therapy (see, for example, the timeline to the development of Herceptin, a breast cancer drug.) However, in the here and now, we cannot predict which of the current experimental endeavors will yield the most useful tools for future treatment of human disease like Usher syndrome, and I would argue, quite emphatically, that it would be unwise to try. Efforts to streamline the early fact-finding, trial and error processes, however well-intentioned, may ultimately slow our progress. Imagine the long-term ramifications, for example, of a decision to reduce or eliminate funding to a line of research which might have made a key discovery about a cellular function, a delivery vector, something innovative which would turn out to have applications far beyond that for which it was specifically sought or developed. A fair number of treatments have emerged as a result of research focused from the start on a particular health concern, but many others have had their origins in deliberately untargeted research. The important point here is that we don't know in advance where such inspired breakthrough discoveries might come from-indeed, there are numerous famous examples of major medical advances from unlikely origins (see an example here). Thus, attempts to make predeterminations on which types of research will be the most fruitful for human health in the long run are risky indeed. Connect with researchers in your community. If you live near a research university or a private research company, get online and look at the science happening there. Universities and BioTech companies often have community outreach programs in place already, designed to make their research and resources accessible to the layperson. Make your interest in Usher syndrome known up front, and they may be able to tailor the information that's most applicable and interesting to you. Connect your community with its scientists. Scientists love to talk about their work, and we're all very used to answering questions about how our work relates to human health. Consider inviting a scientist to speak at your next service organization meeting, or your church, or your school. Again, mentioning your interest in hereditary deaf-blindness will help make the message more relevant. Support science education. Science, along with many other subjects, is an underfunded pursuit in primary and secondary schools. Resources are stretched to the limit and teachers are faced with the challenges of instructing their students with minimal material support. Consider asking your junior high or high school science department for a 'wish list', and generating a community effort to supply some of these items. Alternatively, consider volunteering in the classroom to help with setting up science projects as needed. Support science funding. As already discussed, individual contributions to a specific research program from most of us are tantamount to a spit in the ocean, but the collective power of your tax dollars is, of course, what funds the National Institutes of Health, the National Science Foundation, and similar programs. Find out your representative's voting record for research funding. Contact him or her and voice your support for scientific research funding. I know that it might be a challenge to visualize how some of this more general science advocacy might have an appreciable impact on what you really care about, namely finding better diagnostic and treatment modalities for Usher syndrome. Please note that none of the above suggestions detract from whatever support, financial or otherwise, you're already giving to clinical research or raising awareness of this particular disease. On the contrary, interfacing with the scientific endeavors underway within your communities could absolutely contribute to raising awareness of Usher syndrome. You never know when someone you come in contact with might be inspired to reexamine an old idea, or conceive a new one, with Usher syndrome in mind. Mark has made several prior mentions of the benefits of growing this Usher syndrome Coalition, so I hope this initial foray into the research arena might provide some of you with new strategies through which to advance this goal. We've only just started on this journey. Next time I'll talk more about the connectivity between these different tiers of research and the funding that ties it all together.